Kids have a certain level of energy that’s just difficult to exhaust. Instead of controlling them and asking them to sit still, why not unleash all that enthusiasm into a more productive and fun avenue? Introducing our Kids’ Sumo Suits - the latest party favours that are perfect for all occasions. 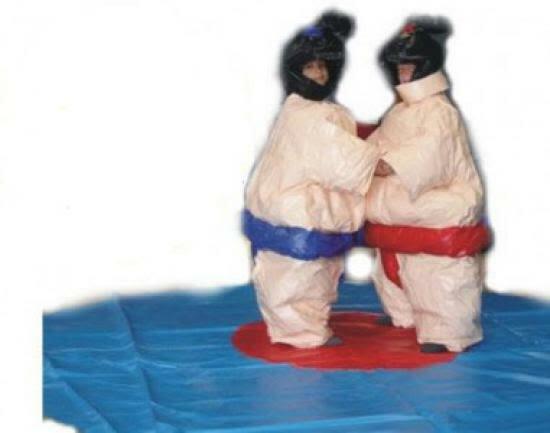 Your kids and their friends will surely have a ball pretending to be Japanese sumo wrestlers with these suits. No need to worry - all suits are tailored with protective padding for the whole body, neck, and head. The circle mat for scoring and judging is also padded to protect kids from falls. Teach them the rules of this ancient sport, and see them have loads of fun! This is perfect for birthdays, graduations, and other kiddie events. Even if your child is having a simple sleepover - liven it up with these suits! As long as you’ve got the space for the mat, then you won’t need anything else. For just £55, you can start a sumo wrestling tournament for some healthy, friendly competition between the little tykes. Find out more about sumo suits (we’ve got ones for adults, too!) and other party favours available by browsing our website, calling us, or sending an email. You can also send us a message with our Contact form.